The global drug market has reached 768 billion dollars of revenues in 2016 and it is expected to exceed $1060 billion by 2022. Although a recent new class of molecules compared with the chemical molecules, the biotherapeutic molecules will account for 40% of the global drug market in 2022 and the market is expected to reach $420 billion. The immunotherapy market alone represents 50% of the biotherapeutic molecules and is expected to grow to more than $200 billion by 2022 at a 13.5% CAGR between 2016 and 2021. It is this segment in strong growth that MabDesign aims to support and contribute to its structuration. The monoclonal antibodies (mAbs) is also a growing market representing by itself $100 billion of revenues in 2017 representing nearly 2/3 of the immunotherapy market. Early 2018, nearly 80 antibodies were on the market and 10 were in regulatory review in the EU or US. This strong growth of immunotherapies is linked to the extreme efficiency of these tools to treat conditions for which chemical molecules are sometimes a failure. Immunotherapies bring therapeutic solutions for a large spectrum of indications including inflammatory, infectious and auto-immune diseases, rare diseases or cancers. Immunotherapies are treatments that use the immune system to prevent or treat diseases by inducing, enhancing or suppressing an immune response. 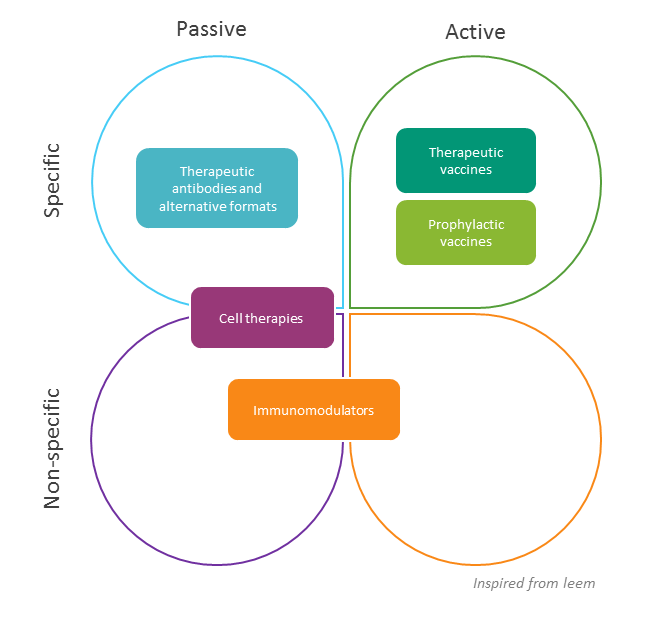 Immunotherapies can be either active, by mobilizing or reinforcing the host intrinsic immune system to a disease (i.e. therapeutic vaccines, checkpoint agents) or passive (by using immune system components that are made outside of the body) and administered to patients to provide immunity against a disease (i.e. mAbs, ADCs). Their action can be either specific by directly aiming the target of the disease (i.e. vaccines, mAbs), or non-specific involving an intermediate target that will have an effector role (i.e. mAbs, cells, or proteins). A support tool is indispensable to the development of immunotherapies and that is relevant to all four areas: the companion biomarkers.